It was a calm, sunny day at Aloha Stadium with 50,101 fans in attendance for the AFC-NFC Pro Bowl on February 2, 1986, marking the seventh straight year that the NFL’s annual all-star game was held in Honolulu. The coaches were John Robinson of the Rams for the NFC and Miami’s Don Shula for the AFC. The NFC had first possession and advanced to the AFC 37 but came up empty when Morten Andersen of the Saints missed a 54-yard field goal attempt. The AFC drove 63 yards in 11 plays as San Diego QB Dan Fouts completed five passes, three of them to WR Steve Largent of the Seahawks. RB Marcus Allen of the Raiders ran for a two-yard touchdown and Pittsburgh’s Gary Anderson added the extra point. 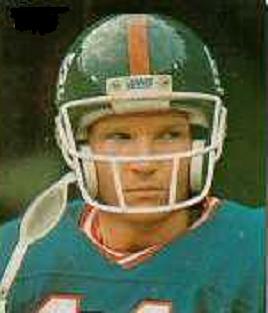 The teams exchanged punts but the NFC was on the move as the opening period ended thanks to three pass completions by QB Phil Simms of the Giants (pictured above), two of them for 16 yards apiece to Tampa Bay TE Jimmie Giles and WR James Lofton of the Packers. However, facing fourth-and-two at the AFC 31 early in the second quarter, a carry by Atlanta RB Gerald Riggs came up short. But the NFC got a break three plays later when a Fouts pass was intercepted by safety Joey Browner of the Vikings, who returned it 48 yards for a TD. Morten Andersen’s conversion tied the score at 7-7. The AFC responded with a 78-yard drive in eight plays. Allen ran effectively and Fouts completed another two throws to Largent (pictured below), and it was Allen taking a pitchout and tossing an option pass to San Diego WR Wes Chandler for a 51-yard touchdown. Gary Anderson added the point after and the AFC was back in the lead by 14-7. QB Jim McMahon of the recently-crowned champion Bears was behind center for the next NFC series, but he was hindered by a knee injury suffered in the Super Bowl. McMahon was sacked for an eight-yard loss by DE Howie Long of the Raiders on first down and, two plays later, was picked off by Denver CB Louis Wright, who returned it 12 yards to the NFC 19. The AFC picked up another three points when Gary Anderson booted a 34-yard field goal four plays later for a 17-7 advantage. Another short series for the NFC ended with McMahon fumbling when sacked by DE Mark Gastineau of the Jets on third down and Denver DE Rulon Jones recovered for the AFC at the NFC 10. On the next play, QB Ken O’Brien of the Jets connected with Pittsburgh WR Louis Lipps for a touchdown. Gary Anderson added the extra point and, with four minutes remaining in the first half, the AFC held a 24-7 lead, which remained the score at halftime. The AFC started off the third quarter by advancing to midfield, but O’Brien fumbled when attempting to hand off and Dallas DT Randy White recovered for the NFC at the AFC 49. After a running play lost a yard, Simms, back behind center for the NFC due to McMahon’s injury, completed three consecutive passes, the longest to TE Doug Cosbie of the Cowboys for 23 yards. Simms finished off the six-play possession with a pass to Washington WR Art Monk for a 15-yard TD, Morten Andersen converted, and the AFC lead was narrowed to 24-14. The teams traded punts before the AFC put together a promising drive. Allen again ran the ball well and Fouts completed three passes, two to Largent for 20 yards and one to Chandler for 23. But after reaching the NFC 18, a Fouts throw into the end zone was intercepted by CB Leroy Irvin of the Rams to snuff out the opportunity. The clubs again exchanged punts and, as the game entered the fourth quarter, Irvin’s 32-yard punt return put the NFC at the AFC 32. Simms threw to Cosbie for 19 yards and San Francisco RB Roger Craig ran twice for 11 yards. It was Simms to Cosbie for a two-yard touchdown and, with Morten Andersen adding the extra point, the AFC lead was whittled down to three points at 24-21. The AFC went primarily to the air on the next series and O’Brien connected on five straight passes and a roughing-the-passer penalty on LB Otis Wilson of the Bears put the ball on the NFC 13. But once again the NFC came through with an interception in the end zone as O’Brien’s next toss was picked off by Chicago LB Mike Singletary. Starting from their 20, the NFC drove 80 yards in 10 plays. Simms converted a third-and-six situation with a completion to Lofton for 19 yards and, after a fumble resulted in a nine-yard loss, he threw to Monk for 17 yards on a third-and-16 play. RB Joe Morris of the Giants gained 11 yards on a fake reverse and, two plays after that, it was Simms to Monk for 17 yards to the AFC 15. From there, Simms connected with Giles for a touchdown and Morten Andersen’s kick made it a four-point game. The AFC had one last shot and it ended when a Fouts pass was intercepted by Irvin to nail down the 28-24 win for the NFC. The AFC had the edge in total yards (382 to 272) and first downs (24 to 18). However, they also turned the ball over five times, to two suffered by the NFC. Phil Simms, who was named the game’s MVP, completed 15 of 27 passes for 212 yards and three touchdowns while giving up no interceptions. The hobbled Jim McMahon was a lackluster one-of-six for seven yards and gave up an interception and fumble. Joe Morris led the NFC rushers with 34 yards on 8 attempts and Roger Craig, who also carried 8 times, was second with 25. Art Monk and Doug Cosbie caught four passes apiece, for 61 and 55 yards, respectively. On defense, LeRoy Irvin accounted for two interceptions and Joey Browner had one that was returned for a score. For the AFC, Dan Fouts was successful on 16 of 27 throws for 173 yards, but none were for TDs and he was intercepted three times. Ken O’Brien was 8-of-15 for 87 yards and a touchdown with an interception as well. Marcus Allen rushed for 58 yards on 16 carries that included a TD and also threw a scoring pass. 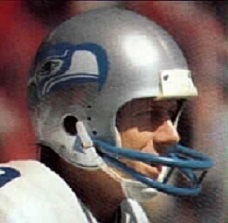 Steve Largent caught a then-Pro Bowl-record 8 passes, for 82 yards, and Wes Chandler gained 114 yards on his four pass receptions that included a touchdown. The game marked a return to the victory column for the NFC, which lost the previous year’s contest after having won two straight. The NFC held a 10-6 advantage since the AFC vs. NFC format had been adopted following the 1970 merger.